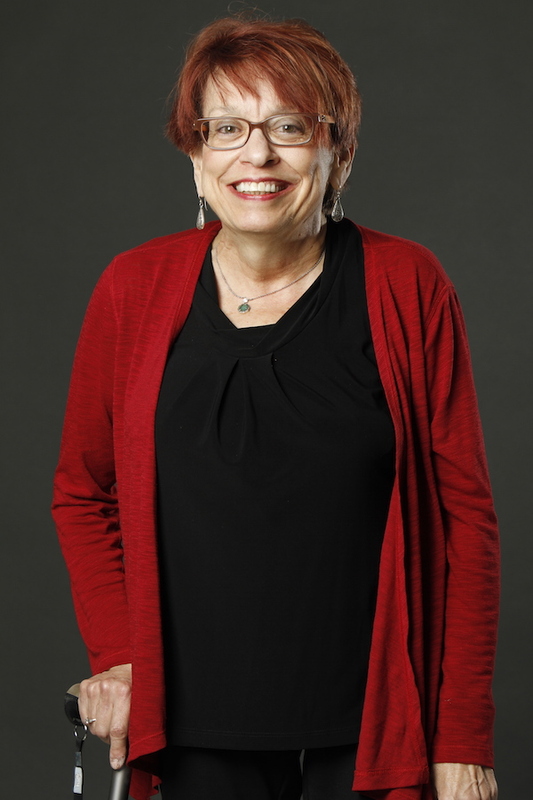 A Retrospective on the Life and Times of Ann Neville-Jan, USC Chan Associate Professor and Associate Chair of Curriculum and Faculty, Who Passed Away Feb. 1, 2015. Doctors didn’t have high expectations for Ann Neville-Jan when the future USC Chan associate professor was born on Dec. 13, 1950. “Your daughter has spina bifida,” they told her mother, according to an autobiographical PowerPoint presentation created by Neville-Jan. “She probably won’t ever walk; she could be mentally retarded; and you’ll need to watch her head because it might get big,” they said, referring to hydrocephalus, a condition that often accompanies spina bifida. The medical team didn’t anticipate the fierce determination of the spunky little girl, though. Just months later, she defied the odds — first by bouncing up and down in her infant seat in the backyard and then by learning to walk at 18 months old — albeit not perfectly. She walked with both feet pointed to the right, her right leg shorter and less muscular than the left. The doctors’ concerns about hydrocephalus never came to pass, and Neville-Jan showed no intellectual development problems through childhood. Rather, she excelled in school, diving headlong into the sciences and eventually earning her bachelor’s, master’s and doctor of philosophy degrees and becoming an occupational therapist. In grade school, Neville-Jan was inspired by the works of Helen Keller, the renowned author, political activist and first blind and deaf person to earn a bachelor’s degree. Keller’s famous quote, “Life is either a daring adventure or nothing at all,” gave Neville-Jan insight into her own life. In high school, Neville-Jan began a life-long love affair with the sciences, partly, she admitted, as a way to understand why she had spina bifida. During an advanced biology class, for example, she learned to artificially induce spina bifida in a tadpole embryo. In 1972, Neville-Jan earned her bachelor’s degree in biology from Towson University in Maryland after deciding to change her educational plans when she came across a career book that described occupational therapy. In 1974, Neville-Jan completed her master of science degree in occupational therapy from Columbia University. During her early career she practiced in mental health settings and held positions as director of occupational therapy at the Boston Veterans Administration Medical Center, rehabilitation coordinator for psychiatric services at the West Los Angeles Veterans Administration Medical Center and education coordinator at the Sepulveda Veterans Administration Medical Center. In 1986, she earned her doctor of philosophy degree in occupational therapy from New York University, and was appointed a Fellow of the American Occupational Therapy Association (AOTA) the same year. Neville-Jan joined USC’s occupational therapy faculty as an adjunct assistant professor in 1987 and became a full-time member in 1989. In the 25 years since, she became an integral member of the USC Chan Division. Throughout her academic career at USC she taught research, theory and clinical courses across the undergraduate and graduate programs; was responsible for various administrative and curricular duties; and chaired dissertation committees for many master’s and doctoral students. She held positions within AOTA and had been invited to participate on panels of the American Occupational Therapy Foundation (AOTF) and the American Academy of Cerebral Palsy and Developmental Medicine. She was a recent occupational therapy consultant to the National Institutes of Health’s National Center for Medical Rehabilitation Research (NCMRR). In 2014, she received the Occupational Therapy Association of California Lifetime Achievement Award. Her scholarship included chronic pain, depression and secondary conditions associated with disability. She eventually became an expert in spina bifida as both a research investigator and participant, and she secured research grant funding from the NCMRR, the AOTF, the U.S. Department of Education and the American Cancer Society. She was a member of the editorial board of the Australian Occupational Therapy Journal, and her academic articles were published in the journals American Journal of Occupational Therapy, Disability & Society and Occupational Therapy in Mental Health. On the evening of Sunday, Feb. 1, USC Chan Division faculty, staff and students were shocked to read an email announcement from USC Chan Associate Dean Florence Clark notifying them that Neville-Jan, who was 64 years old, had passed away unexpectedly after suffering complications from surgery. Almost instantly, Neville-Jan’s Facebook newsfeed began to fill with students and colleagues sharing their fond memories. Judging by the many lives she touched not only at USC but throughout the profession at large, it’s clear that although Neville-Jan is gone, she’s not soon to be forgotten. 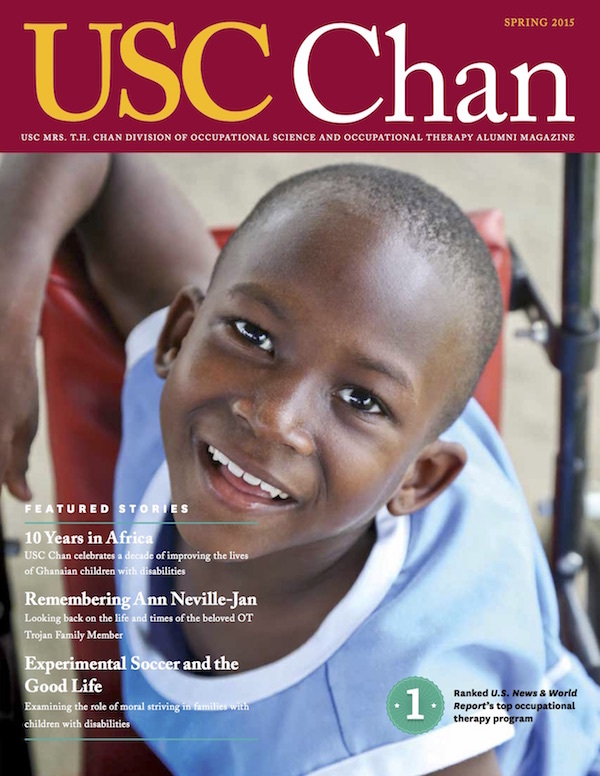 Exploring the many milestones in the life of the recently departed USC Chan associate professor and 2014 OTAC Lifetime Achievement Award winner Ann Neville-Jan.
Dec. 13, 1950. Born in Baltimore, Md. 1972. Earns bachelor of science degree in biology from Towson University. 1974. Earns master’s degree in occupational therapy from Columbia University and enters the workforce as a staff occupational therapist at Creedmoor Psychiatric Center in Queens, N.Y.
1980. “Temporal Adaptation: Application with Short-term Psychiatric Patients,” the first of 12 research articles published during her career, appears in the American Journal of Occupational Therapy. 1984. “I have spina bifida and I lead a very normal and productive life,” Ann Neville tells a national television audience, in response to a NBC News Magazine broadcast about new in vitro diagnostic procedures that can test for congenital disorders. 1986. Earns doctor of philosophy degree in occupational therapy from New York University with her thesis entitled “The Relationship of Selected Personality Variables to Productivity in Depressed Patients.” She is named a Fellow of the American Occupational Therapy Association in recognition for application of theory to practice. 1989. Joins the USC Department of Occupational Therapy as a full-time faculty member. 1992. Named to the Roster of Distinguished Alumni of the Columbia University College of Physicians and Surgeons. 1996. Promoted to associate professor faculty rank. 2014. Receives Occupational Therapy Association of California’s Lifetime Achievement Award. Feb. 1, 2015. Passes away at the age of 64.